Yep. Soon to be installed at Canary Wharf tube station in London, commuters can choose from a selection of one, three or five minute stories across a range of genres. Pros: More people reading stuff. It’s good for the soul, you know? Cons: LITTER! (and if you look at the number of free newspapers left on floors and seat across the Underground network, you’ll know what I mean). 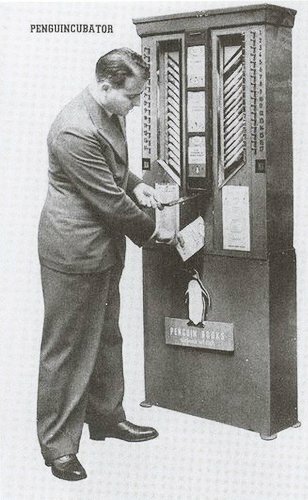 The idea of selling books from a machine is not new; in 1937, Penguin founder Allen Lane installed a “Penguincubator” on Charing Cross Road, a slot-machine book-dispenser that biographer Jeremy Lewis wrote: “shocked his more conservative colleagues”. Sadly, it only sold books. ‘Sadly’ because if there was anything that 1937 London could have really done with more of, it would surely have been penguins. Well, penguins and an absence of impending global conflict. But it seems that book vending machines go back over a century even before Lane’s Charing Cross effort. The first book-dispensing vending machine was built by Richard Carlile in England in 1822. Carlile was a bookseller who wanted to sell seditious works like Paine’s Age of Reason without being thrown in jail. However, it would seem that this was no automated process. Carlile or some other individual was likely sitting in the back of the machine and handing the books out through a slot at the bottom as the money came through a slot at the top. The machines at Canary Wharf won’t have people inside them. Technology has really moved on in the last 197 years. The short stories will be free and won’t actually be books – rather just sheets of paper. They’re already in use across France, the US and Hong Kong, but not in South Africa, where the dual challenges of eleven official languages and rampant theft would mean that the stories would be difficult to share, and the machines only temporary at best. As I mentioned yesterday on certain social medias, my now-more-popular-than-ever Inspired By 6 Spotify playlist crashed through the 150 song mark this week. And please share it around as much as possible. I’d like to be famous just because people love the music I enjoy listening to and have helpfully curated. I was going to go with “shock” or “sad” instead of “crap”, because it is both of those things. 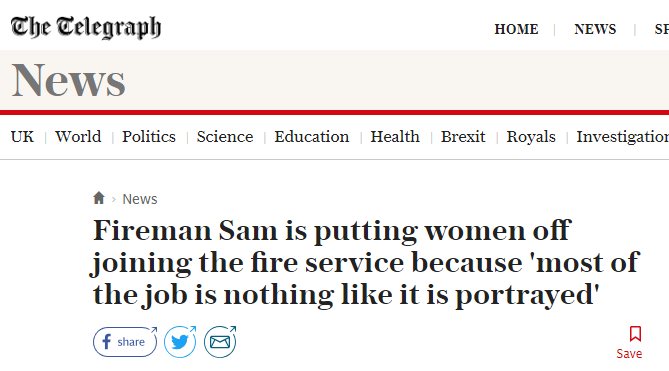 But above all, it’s just crap news. 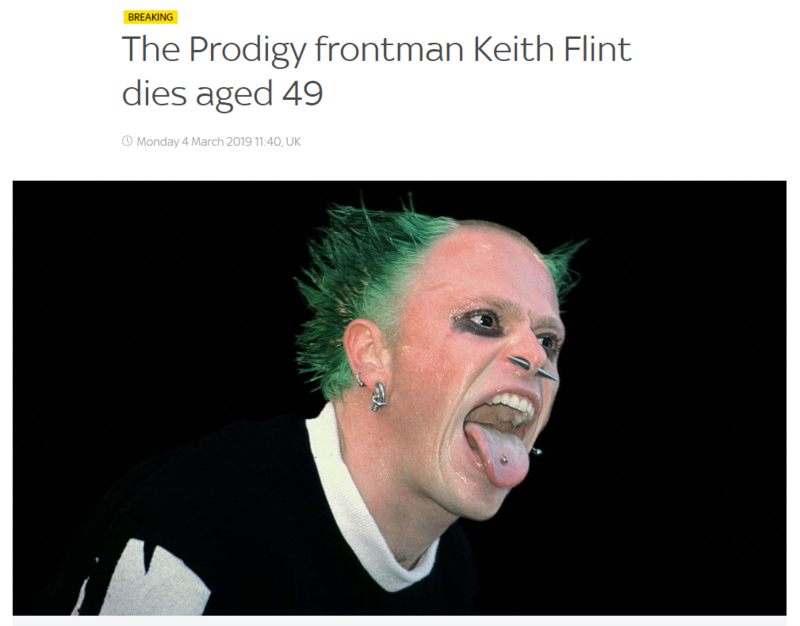 All of our heroes are dying. This would be a TIL, but I actually learned this some time ago and just never blogged it. Table Mountain, Cape Town, South Africa and Snowdon, Wales, United Kingdom are exactly the same height. That height is 1,085m or 3,560ft. Snowdon is the highest mountain in Wales, and the 19th highest in the British Isles. All the higher mountains in the British Isles are in Scotland (Ben Nevis being the highest at 1,354m/4,411ft), meaning that Table Mountain is higher than any point in England, Northern Ireland, the Republic of Ireland and the Isle of Man. I knew this bit anyway, but I didn’t know that Ol’ Flat Top (as no-one calls it here) and Snowdon were exactly the same height. For the record, Table Mountain isn’t even the highest peak in the Western Cape, let alone South Africa. Those records go to Seweweekspoortpiek (2,325m/7,628ft) in the Klein-Swartberg and Mafedi (3,451m/11,322ft) in the Drakensberg. And for another record – and just because it’s a number that has stuck with me since I visited it in 1986 – Mafadi is just 10ft short of being the same height as the highest railway station in Europe: Jungfraujoch sits at 11,332ft. Aside from its altitude, one of the things I will always remember about going there was running along the train platform despite several warnings not to, and becoming very short of oxygen, very quickly. Something I should probably keep in mind when I pop up Mafedi on my next visit to KZN*. * Presented solely as a nice conclusion to a simple blog post. I have no plans to climb this extremely remote peak.